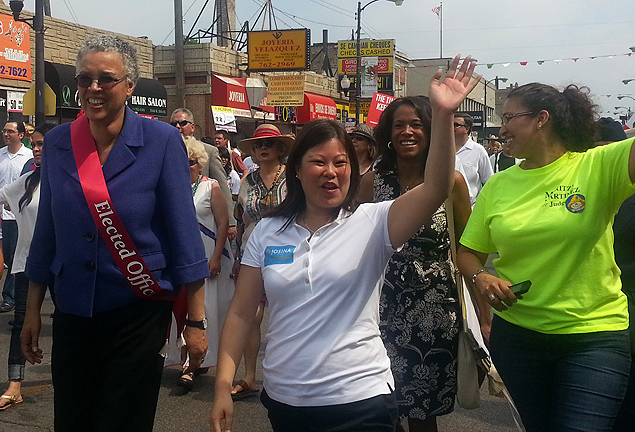 Josina Morita, center, with Cook County Board President Toni Preckwinkle, left, in the Mexican Independence Day parade. 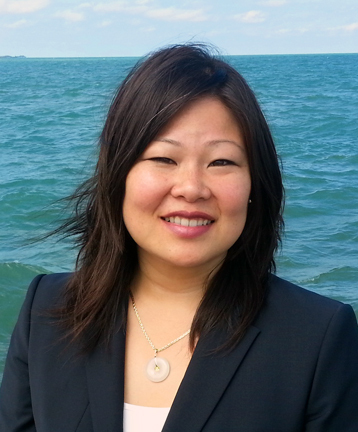 “I think there is a great deal of significance for Asian Americans running for office, especially county-wide,” said Josina Morita, who recently came off of a hotly contested March 2014 election campaign for a seat on the Cook County Metropolitan Water Reclamation District board. Morita is a 33-year old Gosei (fifth generation) Japanese American and sixth generation Chinese American who represents a new face and vision for Japanese American and Asian American political leadership in the greater Chicagoland area. It is a scene where Asian American elected officials remain vastly underrepresented, but are increasingly claiming a political voice in relation to their growing population. According to the 2010 census, despite numbering more than 360,000 residents, and representing roughly 7 percent of the total Cook County population, Asian Americans currently hold only a few judicial Cook County level seats (though some hold seats at the village and township level). In Chicago, Indian American Ameya Pawar only recently became the first Asian American alderman in city history after being elected in February 2011. At the same time, the Asian American population of Cook County grew 26 percent from 2000 to 2010, with additional growth anticipated in the decades to come. This relatively barren political landscape was a stark contrast to the vibrant Asian American milieu that Morita grew up in. Having been raised in a largely African American community in Oakland, California, her parents, stalwarts in the Asian American Movement, exposed her to political activism from an early age. Morita eventually grew into her own political identity as a high school youth engaged in student organizing. Faced with a number of California state propositions targeting immigrants and affirmative action among other issues, her experiences organizing student walk-outs in opposition to these initiatives strengthened her commitment to political activism. Her Japanese American family’s experiences being incarcerated during World War II played an important role in informing her motivations for being involved in community issues. On her maternal mother’s side her family was imprisoned in the Japanese American concentration camp in Tule Lake, California. On her maternal father’s side, her great-grandfather was wrongfully arrested in Seattle directly after the bombing of Pearl Harbor, and was held in a Department of Justice internment camp in Santa Fe, New Mexico until close to the war’s end. The rest of his family was incarcerated in Poston, Arizona. Her great-grandfather would eventually pass away of a stroke after being released from prison, an event that many in the family believe was exacerbated by the conditions he faced while imprisoned. For Morita, her awareness of this family history played a critical role in shaping her involvement. Having moved to Chicago in 2002, Morita has spent the last 12 years of her life primarily in non-profit organizations working on policy issues such as criminal justice, immigration, and redistricting. 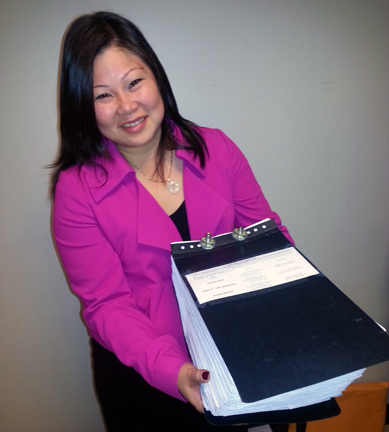 Morita, turning in 24,000 signatures to qualify for the ballot. One of her notable redistricting successes involved helping to form Asian American “influence districts” with a roughly 20 percent Asian American population that now have the ability to increase the sway of the Asian American electorate, especially in close races. Though she never had any intention of running for political office, elected officials who knew her through her redistricting work encouraged her to run on the strength of her community work and background as an urban planner. “A friend of mine, a non-Asian who was in elected office, was at a pre-slating meeting and said, ‘Look, this person just announced that they’re not running again, so you should think about it,’” she recalled. 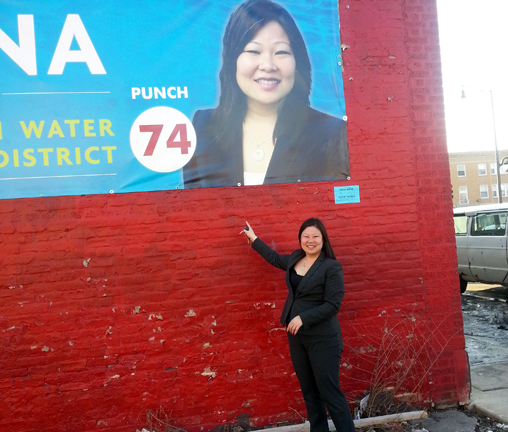 Morita standing in front of a campaign banner at the Proviso Democrats Office. Though often overlooked as an elected county position, the Metropolitan Water Reclamation District board represents a $1.2 billion agency that protects Lake Michigan and the Great Lakes, and deals with important issues of drinking water, sanitation, infrastructure equity, and water management. With Cook County covering a population of almost 5.2 million people, this race covers more people than any congressional district in the U.S.
Morita received strong support from the Democratic Party and, unusually for a first time candidate, a wide range of endorsements from media, labor, and political organizations. Despite these successes, running for this office held its own unique set of challenges. Not least of these was the manner in which the Metropolitan Water Reclamation District board is low on the ballot, remains somewhat unknown to most of the electorate, and involves choosing three candidates out of a field of many. Because of the structure of the electoral process itself, name recognition and placement towards the top of the ballot are critical. 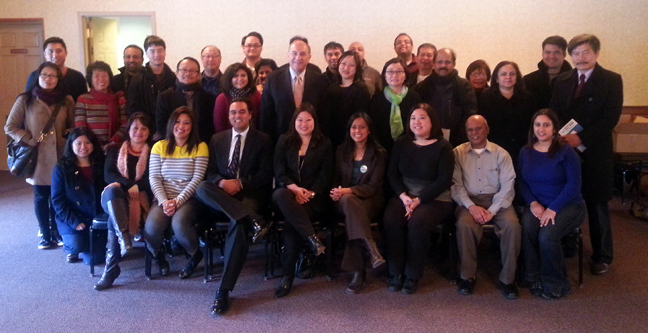 Morita, seated in the front row center, at an Asian American Action Fund event supporting Asian American candidates in Skokie. In terms of the future challenges facing the Asian American community in electoral politics, Morita notes a number of important factors that are required, including enhancing the infrastructure to run solid campaigns, increasing the electoral donor base beyond the Asian American community, and building mentoring relationships and political networks. From her point of view, the political stakes remain high. Currently Morita has continued her activism by heading up the campaign for a statewide ballot initiative that seeks to raise the minimum wage to $10 an hour. This initiative is scheduled for the upcoming November 4, 2014 general election. That said, Morita is unsure if her role in electoral work will involve running for office again in the future. Despite the challenges of running for office, Morita noted how glad she was to have this opportunity and how proud she was of the way the community rallied around her campaign. Note: Morita ended up placing fourth out of a field of ten candidates, garnering 14% of the total vote with a vote difference between her and the next closest winning candidate of 14,845 votes out of 403,497 total votes cast. In recent years other Japanese American women have also run for office in both Chicago and Cook County. Most recently, Lori Yokoyama ran for but lost as a Republican for Cook County State’s Attorney in November 2012. She also ran for 4th Ward Alderman in February 2011, placing second out of a field of seven candidates with roughly 10% of the vote. Also in February 2011 Emily Stewart ran for 46th Ward Alderman, placing third out of a field of 11 candidates with roughly 15% of the total vote cast. Update as of 03/18/2016: In a recent March 15, 2016 second bid for candidacy, Morita won election as one of three Democratic candidates for a six-year term to the Metropolitan Water Reclamation District, with 19% of the total vote, or 230,687 votes. 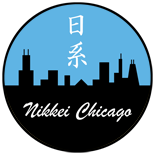 Though she will be on the November 2016 ballot, she is widely expected to win due to Democratic Party dominance in Cook County, and may thereby became the only Japanese American elected official in the Chicagoland area. This entry was posted on October 7, 2014 by R Y in Gosei, Politics and tagged Asian Americans, Cook County, Democratic Party, Elections, Gosei, Josina Morita.